If we can hold onto a little bit of hope that there’s some truth to the notion that right-brainers will rule this century, let’s take a look at how the six main aptitudes of right-brain-directed thinking, aka the ‘Six Senses’, can be used to advance crowdsourced placemaking. 1. Design to complement function. If there’s one thing lacking in modern streetscapes, it’s design. Everyone knows of stumbling onto a strikingly beautiful interior of a building after being misled by a less than attractive exterior, but seldom is that same wow captured in the streets of anything other than in historic cities. 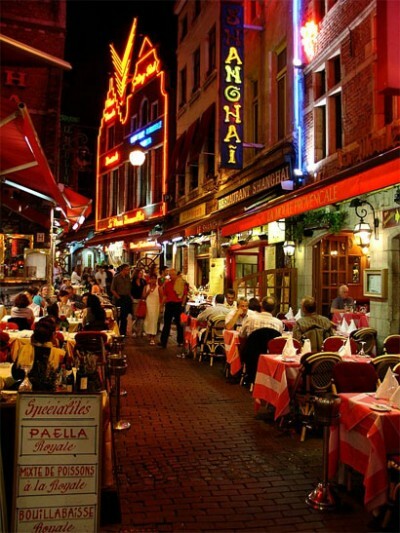 Check out these street lamps, or this street scene in Brussels. 2. Story to complement argument. The great thing about crowdsourcing is that the beta community is not only involved in the story of the place being developed for the first time ever, but they’re the key authors from beginning to end. As a result, little if any marketing (ie ads!) is needed, word of mouth takes over. 3. Symphony to complement focus. Companies and governments won’t rely on specialized departments, but project-based groups that focus on the whole. Crowdsourcing not only requires specialized thinkers to see the big picture, it inspires them to. It’s also a lot easier to develop community-oriented places for that reason. 4. Empathy to complement logic. The #1 motivating factor for crowdsourcing participants? The growing sense of community, and that only comes the more people begin to understand how their shared interests and unique differences make for a vibrant, enriching series of deepening relationships. 5. Play to complement seriousness. Crowdsourcing often works best when game play theory is utilized, like scoring points. It also takes on a heightened level of fun when incorporating the elements of a happy hour. The rule for all our crowdsourcing meetings is, if it’s not fun, it’s not worth having. 6. Not just accumulation but also meaning. Crowdsourced placemaking again, works best when the goal is triple bottom lined, that is, focused not only on financial benefits, but environmental and social as well. In fact, most people won’t even participate if the place being crowdsourced has no triple bottom line impact or meaning.